If there's one thing I love, it's Indian authors - Salman Rushdie, Arundhati Roy, Rohinton Mistry, and now, Thrity Umrigar. Indian authors, as a rule, tend to write really depressing literature with such a light and humorous tone that it makes reading about poverty and slums much more palatable (and I don't feel like slitting my wrists afterwards). The Space between us is a tale of 2 women of opposing social classes. Bhima (an uneducated grandmother who lives in the slums) works endless hours as a servant to Sera (a upper-middle class housewife), though the two have more of a friend-friend relationship than boss-underling one. 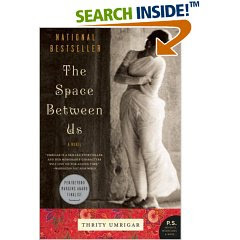 Over the course of the novel, Umrigar details the personal histories of both women (who have helped each other equally over the years) and ultimately, the two share more than one would think. The climax of the novel is shocking, but ends on an unexpectedly cheerful note.